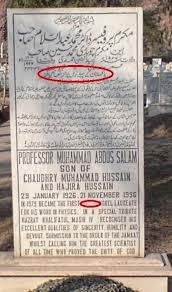 ....though religious extremism certainly was the reason why Abdus Salam had to leave his native land for good and whose glorious contributions to science will forever be disowned by his own (majority) countrymen. According to Thomson Reuters' Science Watch, the Arabian, Persian and Turkish Middle East produces only 4% of the world's scientific literature. Paltry by almost any standards, that value is even more diminutive when paired with the fact that the Middle East, at one time, led the world in science.